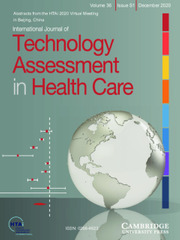 International Journal of Technology Assessment in Health Care serves as a forum for the wide range of health policy makers and professionals interested in the economic, social, ethical, medical and public health implications of health technology. It covers the development, evaluation, diffusion and use of health technology, as well as its impact on the organization and management of health care systems and public health. In addition to general essays and research reports, regular columns on technology assessment reports and thematic sections are published.